Today we filed a Petition for Writ of Certiorari in the case of Michael G. New v. United States of America in the United States Supreme Court. Today, our firm filed a Petition for Certiorari with the U.S. Supreme Court, on behalf of Army Reservist David Olofson, urging the Court to grant Certiorari to review the Seventh Circuit decision affirming Olofson’s conviction. The Petition was docketed on August 31, 2009. 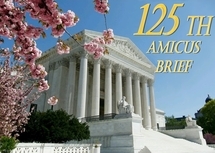 Amicus briefs are due by September 30, 2009. We filed in the United States Supreme Court a reply to the Government’s brief in opposition to former Army Specialist Michel G. New’s petition for review of his January 1995 court-martial conviction (for violation of an order requiring him to wear the United Nations uniform prescribed for deployment to a U.N. operation in Macedonia). Today we filed our Jurisdictional Statement in the Supreme Court in Paul v. FEC.